Astronomy is a dangerous science. It is not just the fact that astronomers love to blow things up. Exploding stars are their bread and butter. For a bit of adventure, they collide black holes. And who else would start the history of everything with a big bang? Put astronomers together with volcanoes, and you have an explosive mix. 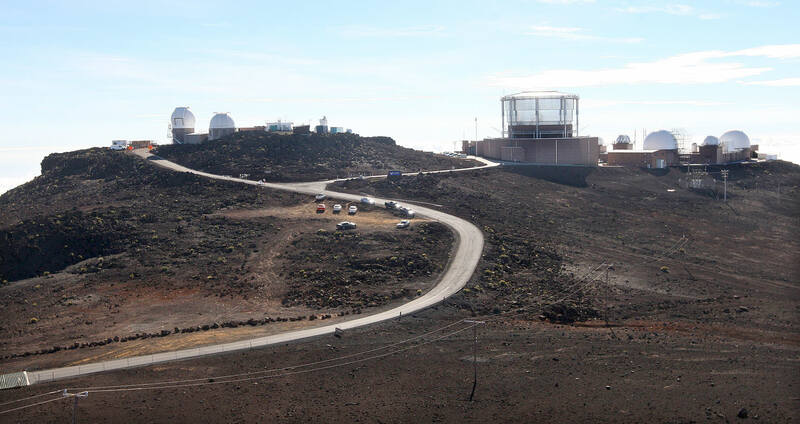 Observatories are often build on volcanoes: the mountains are high, isolated, and especially young volcanoes are smooth which ensures a stable (and dry) airflow over the summit which makes for an excellent atmosphere. Here, stars don’t twinkle – they shine. But it should be seen as a warning that no one else puts their main instruments on top of these young volcanoes. Even volcanologists know better. The lesson was learned after the Etna volcano observatory, which started out as an astronomical observatory, was destroyed by the very lava flow it was meant to observe. Now volcanologists keep a safe distance. Not so for astronomers. They want bangs for their bucks. Whilst the volcanologists relocated to Catania, the astronomers rebuild their observatory on the slopes of Etna, halfway to the summit. Luckily, only two of the world’s major observatories are at significant risk of volcanic damage. La Palma and Mauna Kea are fine: they are very unlikely to have any summit eruptions, ever. Siding Springs, in Australia, is long extinct. Mauna Loa is a major hazard for its solar observatory, located a bit below the summit, which has a seriously reduced life expectancy. And there is one other observatory at risk of being the victim of the mountain it is built on. And it is not on the Big Island, with its perpetual eruptions, but on the next one along, Maui. The volcano is Haleakalā, and it has a 50% chance of erupting this century. Ignoring subsea Lo’ihi, it is the third most active volcano in Hawaii. Perhaps not the safest place to spend the night at work. 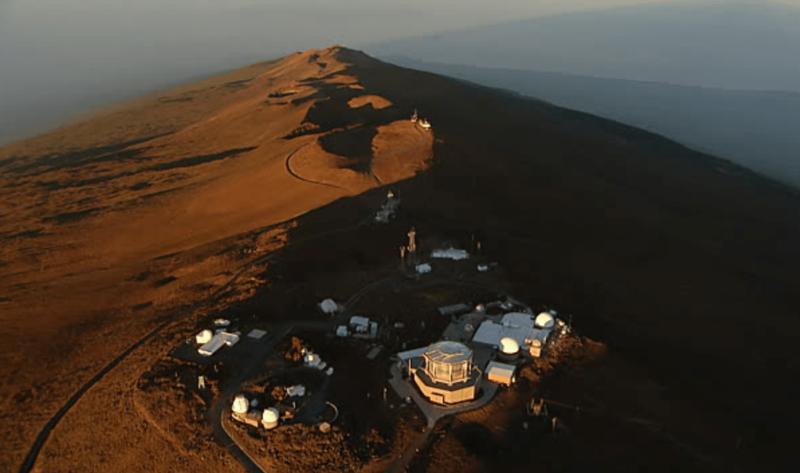 The Haleakale observatory is built on the summit ridge, at just over 3 kilometer altitude. It is just outside the national park boundaries, and just off the highest peak of the island. Unusually for an observatory, the telescopes are packed close together. There are a range of scopes, ranging from night-time astronomy, and a major solar telescope to satellite tracking. There is a gamma-ray telescope, a lunar radar experiment which became a satellite laser ranging system. The solar telescope has a 4-meter mirror and is costing over 300million dollar. Add everything else and there may be equipment worth a billion dollars here. Not everyone is happy about this. Haleakala is sacred to the Hawaiians and they have some issues with the level of build-up. The word means ‘house of the sun’; originally one location, it became adopted as the name for the entire volcano. A major solar telescope would seem to fit with the idea, but one has to admit that the site now looks industrial rather than reverential. But it seems dangerous to put so much value on so little real estate in such a volcanic location. Pele on a bad mood, could easily take revenge. Should the insurance company get worried? The island of Maui is immediately north of the Big Island. As everything in Hawaii (and in fact as are all deep-sea islands) it is volcanic, with as only addition the coral reefs. Maui consists of two volcanoes linked by an isthmus. The West Maui volcano is older and extinct. 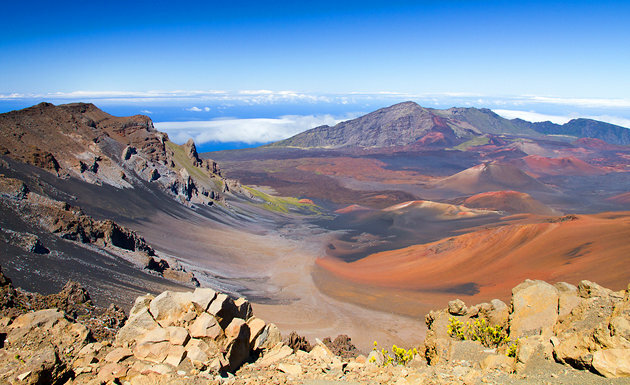 The southern part of the island is Haleakala, which peaks at just over 3 kilometer. 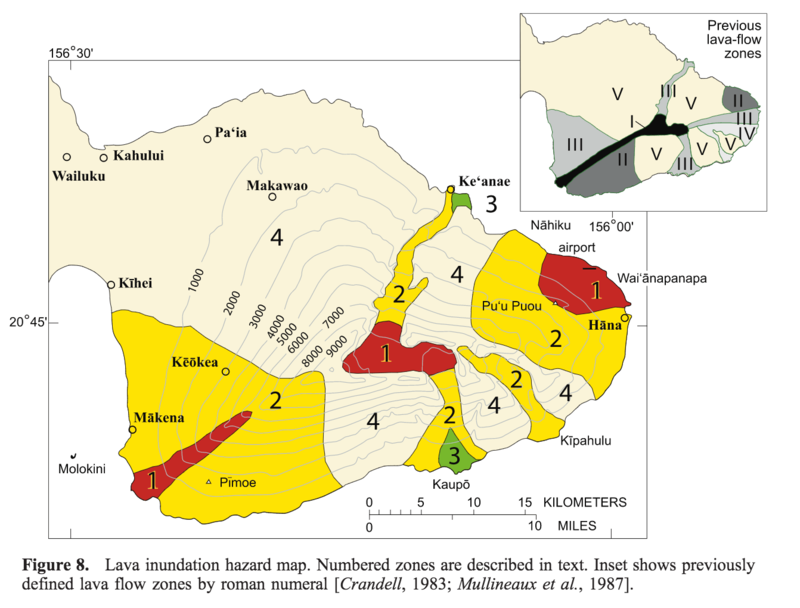 The isthmus consists of lava flows from Haleakala and therefore should also be considered part of it. In the past, it was also connected to the island of Kaloohawe but the connecting isthmus is now entirely submerged. Haleakala has a central depression which is also called the crater (which it isn’t), a peak, several deep valleys, and a large number of subsidiary cones fed from three rift zones intersecting at what is assumed to have been a summit vent. The three rifts are still recognizable, and are helpfully named the north rift, the southwest rift and the east rift. Under water, it continues as the Haleakala ridge. Haleakala (click for the full resolution 30d map) started to form as a shield volcano, with frequent, voluminous and fluid lavas which build a dome a little less than 3 kilomers tall. This was completed by just under 1 million years ago. In the next phase, the lava became less fluid and more explosive. Fire fountains build tall cinder cones. In this phase, the peak become much taller and the mountain steeper. By the end of the phase, it was approaching 4 kilometers and would have looked much like Mauna Kea does nowadays. The mountain had reached peak size around 360,000 years ago when eruptions waned. As eruptions became less frequent, erosion took its toll. Water streams formed rivers, and the rivers carved canyons. Each canyon formed an amphitheatre at the top. New eruptions would fill in the canyons, sometimes overflowing it, but eventually the canyon would reform. The amphitheatres eroded themselves up the mountain: the two largest ones merged and together they ate away the summit. This eroding hole formed what is now called the crater: the 3-d image above shows it well. It never was a true crater: the summit depression is caused by erosion. The summit ridge is the wall of the amphitheatre, and is about a kilometre west from where the original summit would have been. The ridge smoothly joins with the side of the Ke’anan valley. The rift cuts across the amphitheatre and joins the summit ridge more or less at the location of the observatory. Because of the trade winds, the rain falls mainly on the eastern side of the Hawaiian islands and therefore the eroding canyons also attacked the mountain from the east. The west side lacks the deep valleys. The streams carried other risks: at one point a huge mudflow obliterated much of the Kaupa valley. This was not yet the end. Eruptions had never completely ceased. Around 60,0000 years ago or so, it seems the eruption frequency increased again. This phase is named the Kula volcanics. The source of the magma was the same: the chemistry did not change. Even though the volcano had been active for 2 million years and the hot spot was by now 100 kilometer away, magma still found its way from there. The northern rift had ceased activity, but the volcanic eruptions resumed from the other rifts. The lava flows filled in the amphitheatres and came down the canyons. The northern side of Haleakala was not covered because of the lack of activity there, but the other sides were recovered with lava. In this phase, the fissure eruption produced chains of cones. These most recent eruptions comprise the Hana volcanics. Haleakala is still in this phase. Eruptions are continuing from the two rift zones, not as frequent as Kilauea or Mauna Loa but far more frequent than Mauna Kea. The current rate of eruptions is estimated at about ten per millennium. Both in the summit depression and where the rifts meet the coast are areas of black lava, which appear to be very young. This is an active volcano. The changing coastline – or fake news? The two youngest-appearing flows are at La Perouse Bay, on the southwest side of the island. The upper flow came from the side of an older cone, Pu’u Mahoe, 500 meters above sea level. The lower flow came from a parallel fissure, a little eastward but much lower at 200 meters, and emanated from Kalua o Lapa, another cone. The two eruptions may have been simultaneous. The upper one reached the sea and build a bulge extending the cost outward by 1 kilometer. Thurston later (1906) found one other person who talked about family stories, involving a great-grandfather. He tried to estimate from the stories when the eruption could have taken place. He calculated a data around 1750. Others felt that he used high estimates for parenthood, and derived a bit later date of around 1770. In 1965, Loosdam pointed out that historical maps of the coast seemed inconsistent. The oldest maps was by La Perouse in 1786. Compared to the second oldest, Vancouber 1793, it misses the prominence of Kape Kenau. The drawings are reproduced below. Cape Kinau is numbered ‘3’ on the map. 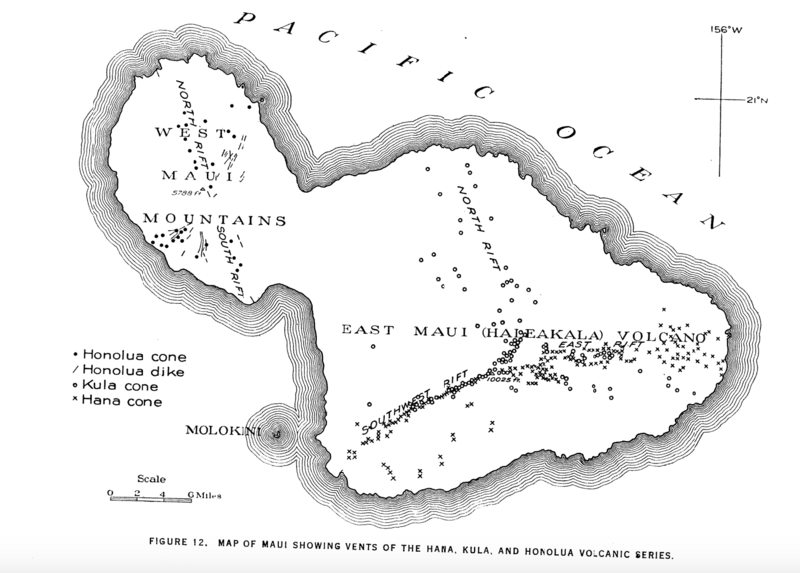 Number 1 is a cinder cone, Pu’u’O Lai. The dotted lines show the route the two sailors took. Cape Kinau is of interest because there were stories among the local people about its formation. The problem with this is that the dates are a bit later than the oral history implies. One can question the accuracy of the maps: it is entirely possible that La Perouse would have missed the promontory. A new surprise came from two other dating techniques. The first was the direction of magnetic north at the time the lava was emplaced. The magnetic north pole is constantly moving, and when the lava solidifies it freezes the magnetic field of that time into the rock. And the orientation of the Perouse lava was not consistent with where the magnetic pole was around 1800: it seemed centuries older. Carbon-14 dates were obtained, and they also pointed at an earlier date, about 1500 AD plus or minus a century. Was the oral history fake news? The answer may be in the stories. There are two retellings, but neither story mentioned that the lava had flown into the sea. It would seem that new land would have been remembered! It seems plausible that the oral memory refers to the second flow, the one that did not reach the sea, whereas the rock dating focussed on the promontory flow. This is just a suggestion, but it reconciles the facts. In that case, there was an eruption around 1500 and another one around 1750. However, the data at the moment only shows a single eruption some 500 years ago and nothing since. Carbon dates have been obtained for a number of the lava flows. This is done by digging through the lava and finding some organic material (twigs or some such) from just below the layer baked by the lava. The lava will be younger than the twig, but if close enough, it may be very similar in age. The oldest flows from the current sequence are 60,000 years old. But people have of course focussed on the youngest looking flows and found interesting results. In the summit depression, two separate flows have been measured at 970 BO and 940 BP. Within the uncertainties, they could have been simultaneous, however they come from different eruption sites. In both cases, the lava went north, flowing down the mountain and reaching the coast at Ke’anae . The older flow came from Ka Lu’u o ka ‘O’o, a youthful cinder cone on the crater floor. The precise eruption point is covered by a more recent lava flow, probably from the same cone, but this flow has not been dated. The younger flow comes from the nearby Halali’i vent: it also contains a 10-cm thick layer of black ash. 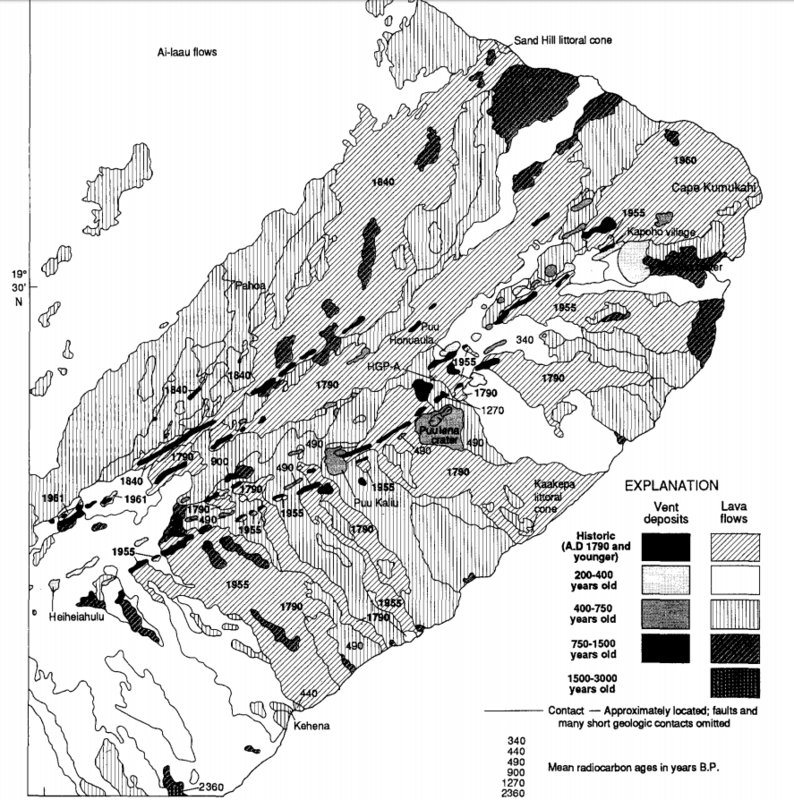 The youngest dated flow in the summit area is in the north part of the crater, and came from the Hanakauhi fissure: it is from 870 BP (plus or minus 40 years). There are apparent younger flows in the western crater area but no date is known for them. There are three flows dated to between 1000 and 2000 BP. It seems that the number of eruption is fairly constant over time. The typical volume of an eruption is 0.1 km3 and the flows reach a few kilometres in length, although flows longer than 10 km are also not uncommon. Over the past 1500 years, lava flows have covered almost 90km2 of the island. That is substantial but not extreme. If the risk was uniformly distributed over the island, ether would be little to worry about for the average local, as the volcano covers close to 1500 km2: each location could expect a lava covering once every 20 thousand years. But the lava flows are highly localized. This is first because all flows originate from the line of the rift, and second because lava always flows downhill. Many area are protected by ridges. The summer crater rim protects much of the island. Elsewhere, lava tends to go down the river channels, something also known from the fissure eruptions on Iceland. 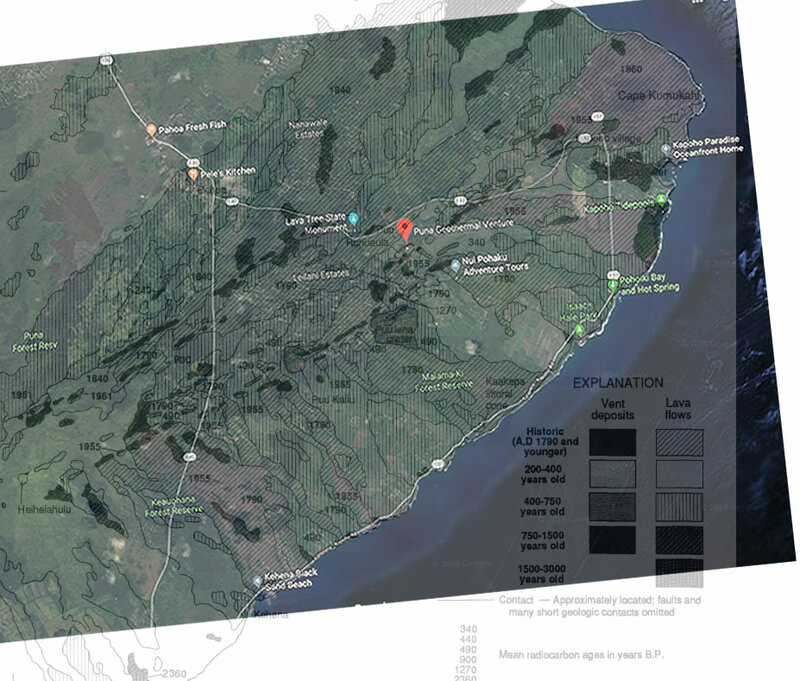 Adding these together, there are three main areas at risk: up-rift from La Perouse bay, the summit depression, and the area round the Hana airport on the east coast. Haleakala is certain to erupt again. We can’t quite predict where, but when it does it will produce a decent-size lava flow. The Observatory may stand above the fray: the most likely location for an eruption would be the crater floor, with the lava flowing down one of the main valleys. The second risk area is the west ridge. When will it be? The volcano may have bene quiescent for 500 years, or there may have been an eruption 250 years ago. The summit has been quiet for 800 years. The calm won’t last forever, but holds for now. The sole GPS on the volcano is located close to the observatory. That makes sense, giving the value of the telescopes there. But the rifts should not be forgotten. If HVO has a GPS or two spare, Haleakala could use them. The astronomers would appreciate. Volcano hazard zones. The Observatory is in zone 2. Kilauea has reached a state of ‘hurry up and wait’. 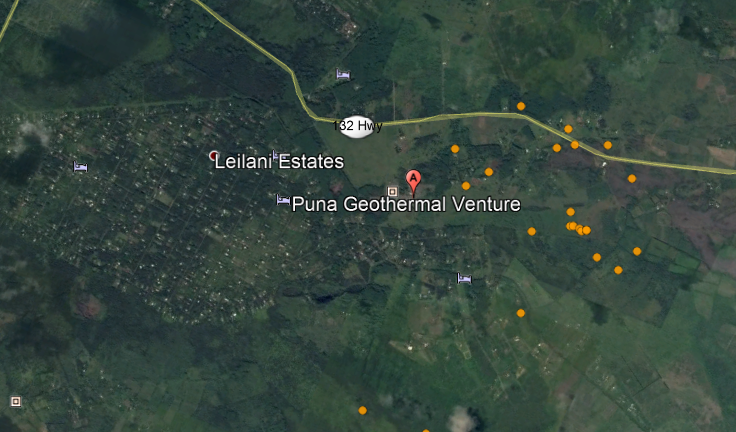 The fissure eruptions have stopped for now, after 15 or 16 separate vents each operating for a few hours, over a few miles right across Leilani. The most recent activity was at the end of the set of fissures, approaching the geothermal plant. Although gas venting is reported around highway 130 to the west, and earthquake activity has intensified around the geothermal plant to the east, nothing of significance has yet happened. It should be pointed out the eruptions so far have not been much more than blowing off steam. There is only one significant lava stream extending for about 1 kilometer. Very little of what has collected below has come up. At the moment, it seems most likely that the next activity will be to the east but really, anything is possible. However, if it does continue to extend east-northeast, the geothermal plant is directly on the track, and a bit further is highway 132: if that is cut, it leaves a section of the coast without a good exit strategy. HVO is reporting that deformation is continuing in the area, so there is still activity on-going and magma is probably still arriving. The flammables are finally being removed from the geothermal plant. One wonders whether the owners might have preferred to collect the insurance money! Pu’u’O’o is dead as a door mouse. The lava pond is fully drained. Whether it will recover depend on whether the conduit has survived. If it has become blocked, than once everything is back to normal the magma may look for other ways out. Pu’u’O’o has survived a lot over the past 30 years and it may well come back from this one too. But the longer it is quiet, the greater the chance of permanent retirement. Kilauea is now the most eagerly watched spot. The lava pond has disappeared from view and can no longer be measured. It was at around 300 meters below the crater floor. The image below is a screen grab from an HVO presentation, showing the decline. As predicted (you read it here first), the decline started exponentially and became linear. What had not been predicted is how fast it would go (2 meters per hour!) and how far it would go down. In the absence of future lava depth measurements, the tilt measurement is the best chance to see what is going on. The plots can be found at https://volcanoes.usgs.gov/volcanoes/kilauea/monitoring_deformation.html and they show continuing linear decay, although with more and more jumps where a minor earthquake indicates some relaxation of the local crust. The big talking point (again, you read it here first) is the water table. That is thought to be some 400 meters down, and at the current rate will be reached within 36 hours. At that point, water will be able to reach the now-empty conduit. Actually, there will be some delay as the walls need to cool a bit. Steam explosions in the walls cause debris to fall down. Once water gets trapped below the debris, significant phreatic explosions become possible. It is far from certain this will happen, but HVO has noted the risk. And these explosions can be massive (although most are not). Expect the overlook with the camera to be badly damaged in such an event, and small stones could reach the observatory building. But all this remains speculation. Kilauea may be changing its behaviour now, or things may go back to the old ways. HVO is giving out warnings – not predictions. Been on top of Haleakala several times. It really is quite a sight to behold. Do they still have the killer one-way bike rides from top to bottom? And reportedly, the fissure is now within a mile of the Geothermal plant. And that National Guard presence is being increased in Leilani Estates due to looting fears. At night, I tend to leave the emergency services dispatch playing on my phone. I do know that Law Enforcement has been working a lot of “suspicious person” calls there and may have made a few arrests. IMO, thieves are probably the lowest form of life… probably on a level below virii. Note: There is no example of a plural for the word virus in Classical Latin, so stuff it. Is that a new fissure (16?) or fissure 15? HVO has stated the eruption has paused again at 8:00 so this could be very new. There was a persistent light further to the east than any of the mapped fissures last night, but there wasn’t much that became if it other than it staying basically the same until the morning and then the area fogging over. I thought the plural for virus is ‘virae’ or something like that (or just viruses). It doesn’t look right when written down but it sounds familiar. Fixed, thanks! There may be more. And you are probably right that the spellchecker prefers ‘scared’ over ‘sacred’! Fear is more politically correct than respect. This would have been about 8 years ago that I read this, and in hindsight whoever wrote that source wasn’t being very logical… That would basically mean that everything that isn’t old looking would be only 300 years old and that is a lot of stuff, it probably would have been the biggest lava eruption ever in historical time, not only would the Hawaiians have noticed it but probably the whole world… Either that or someone thought the area would survive for half a million years without being eroded while younger terrain elsewhere gets completely destroyed. The eruption rate of about 3-4 times per 1000 years now is still an anomaly given that it left its shield building stage before the big island existed, but it makes sense compared to the other explainations. No mention of Maui Nui? Quake cluster on the other side of the Geothermal plant. This means that the plant is in a direct line between the fissures and the cluster. Meaning? Probably dike extension. And to reiterate what the Hawaii News Now site put out, Pentane is chemically similar to gasoline. That means that the main threat from it is conflagration, not explosion. And yes, they are working to remove the material off site. However, they are reportedly not very forthcoming about their activity to the local community, or even their workers. I wonder if the geothermal plant will work better after this, it is evident that the dike went basically right under it so it might have been basically turbo charged. The earthquakes moving down indicate an increased risk of eruption on the flat area between the plant and kapoho crater, and a vent opening at that elevation will probably have some interaction with groundwater at some point. Due to the amount of magma pushing down, an eruption here could be quite a big flow. Once you achieve the condition of “dry steam,” additional thermal mass heating the steam doesn’t really give you much more of an advantage in power. The system is going to be limited by the turbine design, but it does allow you to put in additional heating loops and more turbines. Probably explains why the News from last night noted a truck moving some of the material. Reportedly they had transferred 30,000 pounds of it. Dunno if that goes against the also reported 60,000 lbs on site or if they had 90,000 to start with. I get from the latest update, that it should all have been removed by now. Screen grab from the USGS video illustrating in cross section what they think may be possible. Notice the regression that points to mid May as being when things get potentially weird with steam driven eruptions from Kilauea. Of note, the potentially lethal rock shards (1924) stayed within about a km of the summit crater. And a link discussing the mechanics of it. Maybe the water table is actually higher than expected and the steaming that is really strong on the webcam now is a result of that. 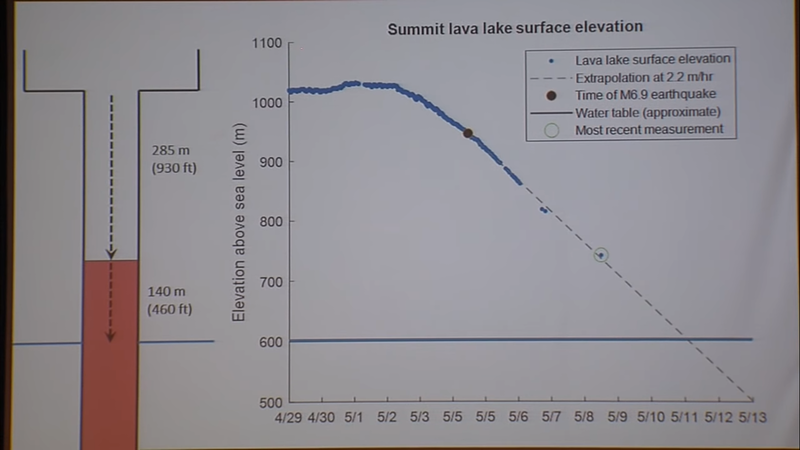 The summit has now deflated to the level it was at in May 2015, when the first lake overflow happened, a total distance of at least 20 cm, which would be equal to 200 microradians of deflation. Pu’u o’o is also still showing deflation so all the magma is moving into the lower rift zone, this could result in an event similar to 1924 (except this was still an eruption even if it was small), but I somehow doubt it at the present time, as the 1924 intrusion was much quicker and extended offshore into the puna ridge, neither of which have happened in this event. Everything I’ve seen places the water table at an “approximate” depth. Even “Tina” from the USGS video (above) pointed out that the water table depth is not fully certain. Though the intersection of the draw-down graphically intersects with the estimated level tomorrow (Friday) that doesn’t mean that anything will happen with any certainty. It’s just a possibility that we should be aware of. The tall guy (don’t remember the name) pointed out that the Mag 6.9 could have opened up additional space for the magma to fill in the rift and that could account for the discrepancy in draw-down volume vs erupted volume. My read of the presentation is that there could even be water intrusion towards the now emptied pipe area of the lake and that partially saturated rock could fall from the wall into the magma pool and cause a steam driven ash event. That ash column seen the other day could very well have been the result of such an occurrence. I am somewhat reluctant to follow the idea that magma is filling in the gap where this quake happened. I know it would make perfect sense and that I have been quite confident in assuming that is what happened in 1975, but there is one problem with the idea when it is applied to the current situation. The quake happened under the pulama pali which is obviously downslope of pu’u o’o, so if any space was created the magma would be going into the area under pu’u o’o, but there is still deflation at pu’u o’o (it has started to level out but it is still going) so the magma is not stopping in that area and therefore it must be going into the lower east rift. This is probably why the intrusion has gone a little bit past leilani now, and also why there is steam near the highway, which could have been a failed eruption that is at risk of erupting in the future. I don’t think this series of eruptions is over yet by a long shot, in fact it is probably only beginning. Well, an alternate view is that by shifting the entire slump, lithostatic confining pressure on the rock surrounding the rift is lower, making dike propagation easier. I’m not going to do a “chicken vs egg” look at it, the Hilina slump has already been in motion for many years. 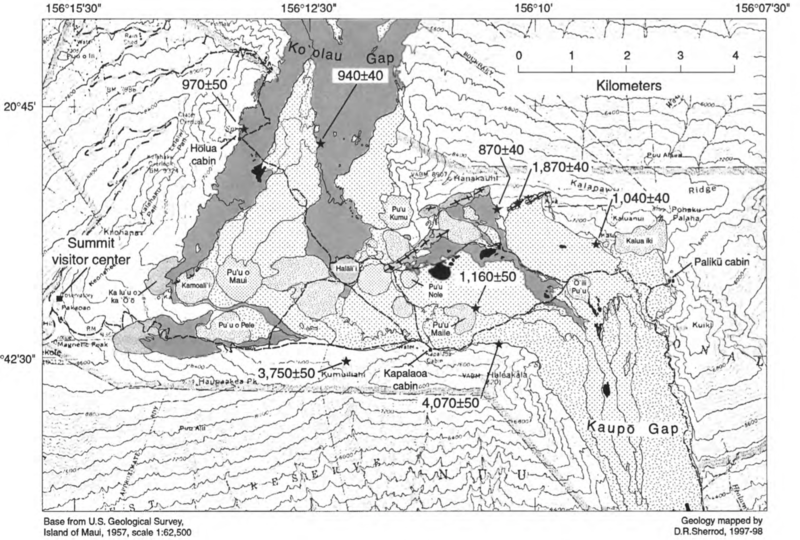 The 6.9 could have been caused by, or was part of the cause of, the current dike and fissure activity. ‘Who caused what’ is better left to the Geophysicists. Yer probably right on target. Uncanny timing, was just watching a documentary on the solar telescope at Haleakala and its monitoring of solar activity! Haleakala’s last eruption is stated to have been 1540 +/- 60 years. An eruption rate of 3 per millenium would make it about equal to that of Hualalai- a.k.a the forgotten volcano! The one I would wory about most as many don’t even seem to know about it at all, and is in an area that is at high risk. I was going to write a guest piece on it a while ago but I can’t seem to find a right lot of info on it. Anyway, I’ve wondered why it is that both Haleakala and Mauna Kea are still active, but the volcano inbetween them, Kohala, is long extinct? I would’ve thought it would be Haleakala that is extinct and Kohala still active… On the other “side” of the hotspot progression, West Maui and Mahukona are long dead, but Hualalai and Mauna Loa are active. I guess the termination of activity of volcanoes in the Hawaii-Emperor chain isn’t always sequential to the ages of them. On one last note (! 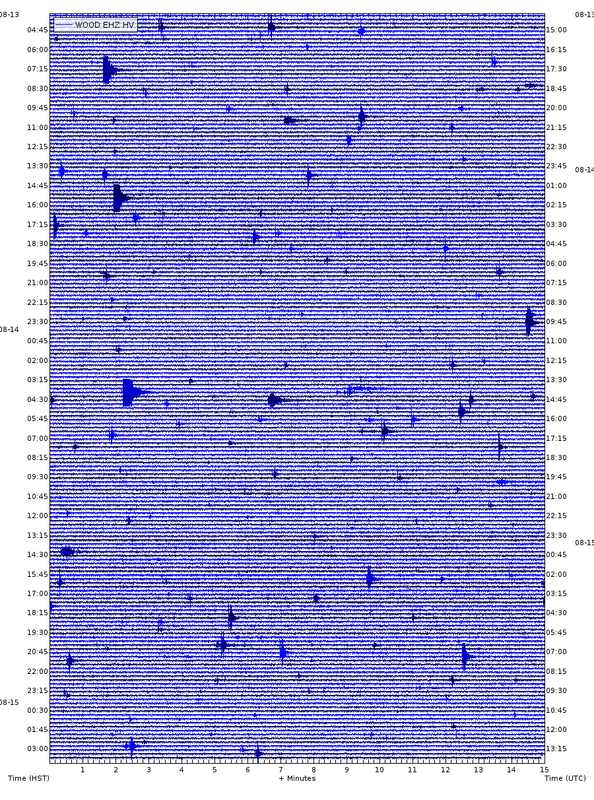 ), has Haleakala had major collapses? It sort of looks like it? You should consider not just the number of eruptions but also the volume. Hualalai erupts about as often as Haleakala, but in terms of volume is in a different league. It produces much more lava than the latter in each eruption. The two lines, one along KIlauea-Mauna Kea-Haleakala, and the other Lo’ihi-Mauna Loa – Hualalai are a bit different, probably in magma temperatures. Lava composition is reported to be different along the two. However, HVO has really muddied the waters here by stating that Kilauea is getting its magma from the deep region on the coast south of Mauna Loa. I see why they came to that conclusion but it means that the first line is getting its magma from the second one. I think the areas where the volcanoes get their magma significantly overlaps. 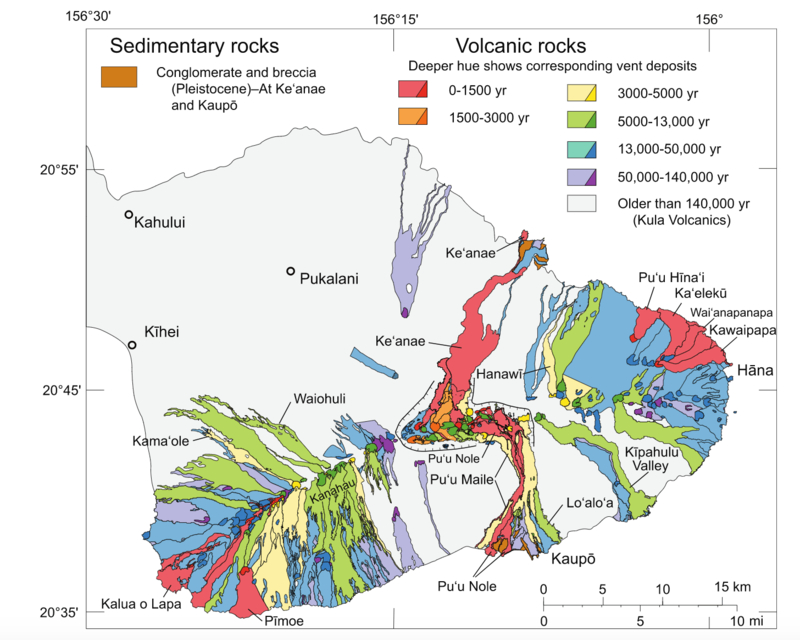 They are fed from generally different sides of the hotspot, but mauna loa and kilauea probably do share parts of their magma sources, with kilauea taking the much larger share since 1950, leaving mauna loa mostly inactive. Loihi will probably one day be big enough to interact with both of them, at which point kilauea might start behaving more like mauna loa does now, and mauna loa might be starved of magma and go into its post shield phase. Maybe that is what happened to hualalai, which is rather smaller than the other volcanoes near it. The real question is why haleakala still erupts every few hundred years, while kohala is ‘extinct’ and mauna kea only erupts every 5000 – 10,000 years or so, despite being slightly over the hotspot still. Maybe there is a second part where the plume is shallow, and so it sort of revives the old volcanoes. Maybe kohala will become more active again in the future, as it goes over the area where Maui is now. 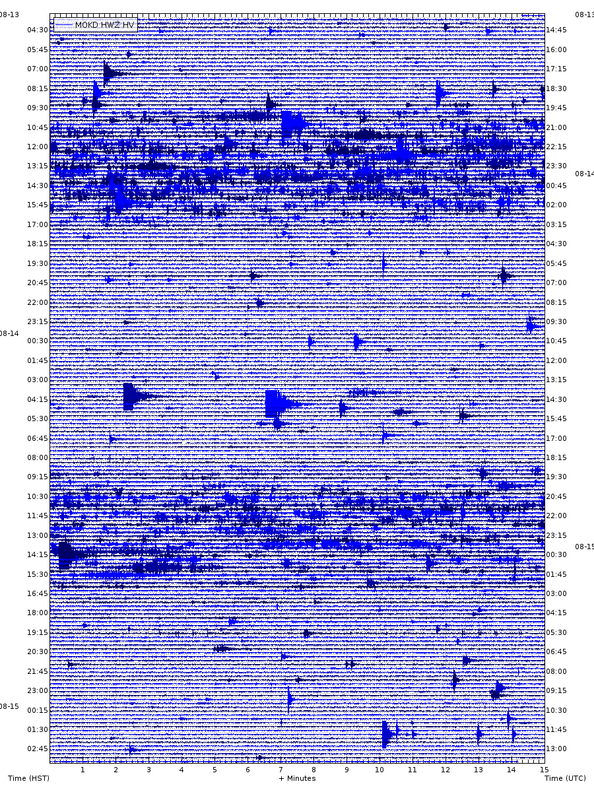 All the older islands undergo ‘rejuvenation’ eruptions which are small and localized but have happened even on kauai within the last 150,000 years, but these are much too small to explain the significant activity at haleakala, which is still in its post shield phase according to HVO. Could it be that the plume achieved more thinning of the lithosphere under haleakala because it was more active at that moment? If its thinner maybe that allows for magma intrusions to last longer after the center of the plume has passed underneath. And also do we know how much does the intensity of these plumes fluctuate in these short periods of time? Looking at the most recent post I suppose that the lithosphere under maui must be thicker because of the isostatic subsidence of the erupted mass. But still there should be a more hotter and ductile zone right under haleakalas summit or close to it that is like this because of the strong volcanic activity of Haleakala in the past and maybe other volcanoes like Kohala may cool quicker for the havent had such strong volcanism right? The plume in effect creates a series of chimneys. Once a chimney exists, that is where the heat will go. You don’t need to fluctuate the plume intensity: you will always get several chimneys. I know there must be chimneys under every volcano. But I was trying to say is that Haleakala must have developed a wider more long lasting (proportional to the higher emission rate?) feeder system than Kohala for example. But those were just speculations and i dont know much about Hawaii volcanoes. When trying to think about other example the only other i can come up with is La Gomera which is very close to the actual location of the canary hotspot yet is extinc and maybe it is because it hasnt had a very strong activity in the past i think. This link is updated regularly and shows the positions of the fissures. The steam appears to have picked up quite considerably. However, some rain showers have just come through the area, so this is most likely just the result of rain water being heated and evaporated by the lava already on the ground. A Kilauea update has been added at the bottom of the post. what about the cone right next to the power plant especially with the earthquakes being on the downside of it, with enough pressure could it be an option, if the fissure dike gets bogged down? That cone is called pu’u honuaula, and no not really. If a new eruption happens to erupt inside the crater of an old vent then it is still counted as a new eruption and not a revival of the old vent. All the eruptions on the east rift of kilauea are just that, part of kilauea, so the cones are not their own volcano either, and once they form they would be just be another little bit of kilauea. From what I have read, part of the 1955 eruption happened on both sides of this cone and not within its crater, so maybe old cinder cones in Hawaii actually act as gaps in the fissures. One place that could erupt more than once is pu’u o’o, because there is quite a big store of magma in that area, and it has revived itself multiple times after the system broke down, however the eruption there that was started at its formation in 1983 probably ended with this event. An eruption there 10 years in the future wouldn’t be considered a revival of the 1983-2018 eruption. Quick overlay, not brilliant but all I had time to knock up this morning. Its interesting that there is a spot, very close to the spot where the steaming above the road is, where an eruption happened in about 1790 and the lava flowed south despite being north of the ridge… Maybe that area is really flat and lava can flow either direction. It might help if you can overlay the recent fissures onto that map, including the steaming areas at the highway, so we can get a better idea of where to expect the lava to flow? The steaming area near the road is getting bigger too… Probably not a good sign. The steaming cracks are right at the start of the line of steepest descent that leads through the middle of leilani so an eruption here could be a big deal, unless the lines are incorrect or the land is very flat and lava can go anywhere from there. Merapi is erupting in Indonesia, the same one that had a VEI 4 in 2010. Seems to have been a sudden single explosion but it might not (probably wont) stay that way. It was a phreatic event, pretty unpredictable. This is what it looked like from the perspective of some of the unwitting hikers. 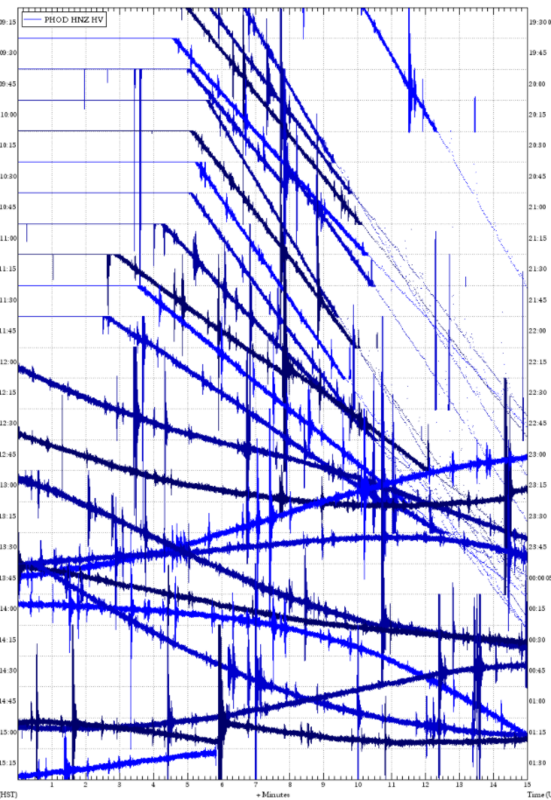 I don’t know how much we can trust the PHOD instrument or it’s plot (the plot on acid)…..but there seems to be some tremor just after midnight on the plot. Would kind of make sense with all the eq in the area. SDH seems to be a good proxy for the lava lake levels. And it is now accelerating its drop, it looks like this changed about 18-24 hours ago. Not major, but the decrease is increasing. It is interesting to note we are looking increasingly in the clear re: 6.9 being a foreshock, however, the events of the lava lake may argue that whatever is impending is simply taking its time. Please be aware of the next post!